� On the FIVB Tour, Rogers and Dalhausser began the 2007 season with a pair of fifth-place finishes, but then played for a medal in 41 of 49 international tournaments through the end of the 2012 season (winning 22 times in that span). � From 2008-2010, Rogers and Dalhausser won nine of the 13 FIVB Grand Slams they played, along with two seconds, one third and one fifth. � Rogers was tied atop the AVP Tour in victories over the five seasons from 2006-10, tallying 43 in those five years. � He was the only AVP player to have won at least one title every year from 2004-10. � Rogers and Dalhausser were in the semifinals of 39 consecutive AVP team events they competed in, from July 2006 to May 2009. � Rogers and Dalhausser won a gold medal in Quebec in 2011, helping the USA to its first ever podium sweep on the FIVB Tour. 2015: Rogers played with Stafford Slick, and the duo had a best of a third-place finish on the AVP Tour. Rogers ended the year ranking 10th in digs per set (4.42). In their first event together, in China on the FIVB Tour, Rogers and Slick finished fourth. They played three FIVB events on the season. 2014: Rogers formed a partnership with Theo Brunner, with their best finish a second-place showing in Manhattan Beach. They played seven AVP events together, and also had a third and three fifths on the year. Rogers was second on the AVP Tour in digs per set (5.73). Rogers and Brunner competed five times on the FIVB Tour, getting their best finish in Long Beach as they won a bronze. 2013: Rogers began playing with Ryan Doherty, who had never played on the FIVB Tour, marking the first time Rogers played an FIVB event with a partner other than Dalhausser since 2005. They placed 17th in the World Championships in Stare Jablonki and had their FIVB season best of ninth in the Grand Slam in Long Beach. Rogers teamed up with Theodore Brunner for the Grand Slam in Xiamen, and finished 17th. On the AVP Tour Rogers and Doherty placed second in the season opener, and then their other two semifinal appearances both came in the first four events. The duo was the fourth-ranked team on tour. 2012: Rogers and Dalhausser won their first two FIVB events of the year. The rest of the season the duo advanced to four semifinals, winning two bronze medals. They finished ninth in the London Olympics. For the season, the pair played in nine events with four medals, ending as the third-ranked team on the FIVB Tour. 2011: Rogers and Dalhausser began the year with two gold medals, extending their streak to seven straight tournament wins, and in the process established a new FIVB record for consecutive match wins (40 straight until the gold medal match in Prague). After three tournaments without playing for a medal, including a ninth-place finish at the World Championships in Rome, the duo ended the year with medals in each of their last six events, including two wins. 2010: Rogers and Dalhausser advanced to the championship match in the AVP season opener in Fort Lauderdale, but the match was cancelled due to weather. The duo swept their first 13 straight opponents on the AVP and won all 34 matches, winning five titles in the process. The pair dropped only six sets on the AVP Tour. On the FIVB Tour, Rogers and Dalhausser came through the contender's bracket to win the season opener in Brasilia, becoming the first American team to win a title in Brazil since 1996. They won nine titles in their 12 international outings, setting the mark for the most team wins in FIVB single season history. The pair won the last five FIVB events they played in, including three Grand Slams, ending on a 23-match win streak. 2009: Won the season opener with Dalhausser, marking the third straight season the duo has begun the AVP year with a title. The pair won four of the first five AVP events but then did not win in their next three tournaments, marking the first time since 2007 the duo had gone that many domestic events without garnering a title. Rogers and Dalhausser won the next three AVP events, locking up their fourth straight season with the most team wins on the AVP. On the FIVB Tour, the pair placed third in the World Championships in Stavanger. In Marseille, Rogers and Dalhausser put an end to the record 25-match win streak by Germany's Julius Brink and Jonas Reckermann en route to winning the title, their first international victory since their Olympic Gold in Beijing, before winning another Grand Slam title in Klagenfurt. The duo returned to the U.S. and won three straight AVP titles before their 34-match winning streak was ended in the Chicago finale. Rogers ended the AVP season ranked eighth in digs per game (4.81). 2008: Rogers and Dalhausser began the season claiming the first five AVP titles, winning their first 27 matches before placing third in Atlanta, the only AVP event they did not play in the finals. The duo won 11 domestic titles and for the second straight season Rogers was the top-ranked player. He was third in kills per game (7.41), eighth in hitting percentage (.411) and ninth in digs per game (4.85). Internationally, the duo played seven events, winning medals in all of them. They began the season with a pair of bronzes, then in four Grand Slams won a silver and three golds. During the Olympic qualifying process, they accumulated the highest point total in the world, and entered the Beijing Games on a 21-match FIVB winning streak, one win shy of the record. In their first match, they were upset by the 23rd-seeded team, but rebounded to win the gold medal. 2007: Rogers and Dalhausser advanced to the semifinals in all 16 AVP team events, winning 10 times, including in Manhattan Beach. In the indidual event in Las Vegas, he placed third, and the winnings pushed his career total over $1 million as he became the 13th player to do so. Rogers was the top ranked player on tour and he was fifth in digs per game (4.89) and seventh in both kills per game (7.08) and hitting percentage (.418). Internationally, the duo won three medals, including a gold medal in the World Championships in Gstaad, marking the first time an American team had won that title. 2006: Began playing with Dalhausser, and the duo placed ninth in the season opener before winning the next four tournaments. They failed to advance to the semifinals just once after that, finishing fifth, and tallied a total of eight wins in nine finals appearances, including a win in his hometown of Santa Barbara after four straight second-place finishes. In the individual event, Rogers won and played with Scott in the finals. Rogers was the third-ranked player on tour, and was sixth in digs per game (4.53), eighth in kills per game (6.82) and 10th in hitting percentage (.429). He and Dalhausser played six FIVB events, winning three medals, including a gold medal in the Grand Slam in Klagenfurt that ended a 50-event drought for U.S. men winning internationally. 2005: Rogers played one event with Scott, then one event with Reid Priddy, finishing 17th after being eliminated by Scott. Rogers and Scott reunited and played in two straight AVP finals and closed the domestic season with three consecutive wins. Rogers had his first top ten player ranking (ninth) and was fourth in digs per game (5.17) and seventh in hitting percentage (.436). 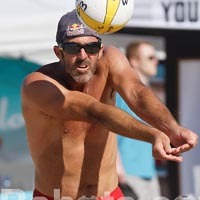 On the FIVB Tour, Rogers played with Phil Dalhausser for the first time in the World Championships in Berlin, placing seventh, and in six events with Scott, with a best of fourth. 2004: With Scott, played in the semifinals in six of seven AVP events, winning once. Rogers was fourth in digs per game (5.28). Internationally they competed in 11 events, finishing fourth twice. They just missed qualifying for the Olympics, finishing as the third-ranked U.S. team and were the fourth-highest ranked team worldwide to not qualify for the Olympics (due to country quotas). 2003: Started the season playing two events with Eli Fairfield, finishing ninth both times. Then he reunited with Scott, making two semifinals including one championship match on the AVP, and a best of fifth on the FIVB. 2002: Began playing with Sean Scott, with a best of fifth four times on the AVP Tour and once on the FIVB Tour. 2001: Won the season openers on both the AVP and the BVA with Holdren, followed by second-place finishes on both tours. Played eight FIVB events with Holdren, with a best of fifth in the World Championships in Klagenfurt, and one event with Sean Scott, finishing ninth. 2000: Began the year with a win on the USA Volleyball Tour with Holdren. Early in the season the pair played in an FIVB event in Rosarito, Mexico, and after qualifying won despite being the 32nd seed. Immediately following, the duo played in four straight AVP finals, winning twice. 1999: Advanced to the semifinals in six of 10 AVP events with Holdren, with a win in Louisville. Holdren played one tournament with Canyon Ceman, finishing third. 1998: Played 19 team events with Holdren, and did not have a finish lower than ninth. They played in four semifinals, getting their first win in Minneapolis. 1997: Earned Rookie of the Year honors as he and Holdren advanced to three semifinals, including one championship match. He played one event with Kevin Martin, placing 17th. 1996: Played four events with Holdren with a best of 13th. 1995: Made his pro beach volleyball debut in Manhattan Beach with former college teammate Dax Holdren, finishing 25th in his only event. � Qualified for 2008 Beijing Olympics as the number two seed with Phil Dalhausser. After finishing pool play with a 2-1 record, the duo won all four matches in bracket play in winning the Gold Medal, defeating Marcio Araujo / Fabio Luiz Magalhaes of Brazil in the finals. � Qualified for 2012 London Olympics as the number two seed with Phil Dalhausser. Advanced from pool play with a 3-0 record, then lost in the first round of the elimination bracket to Italy's Daniele Lupo and Paolo Nicolai, finishing in ninth place. College: Attended University of California Santa Barbara where he earned All-American volleyball honors (1995-96). Set the school record for career digs (783) and recorded the second best season total with 246. He left the school second all-time in assists (4,831), ninth in total blocks (270) and eighth in block assists (222). He received a degree in Religious Studies and a minor in coaching from UCSB. Personal: Rogers was the assistant men's volleyball coach at UCSB from 2000 to 2005. He is married (Melissa), and has a daughter, Hannah, and a son, Nate.